Enjoy the thrill of Halloween events this week. Plays, mystery games, spooky science experiments, and Halloween parties to check out this weekend. 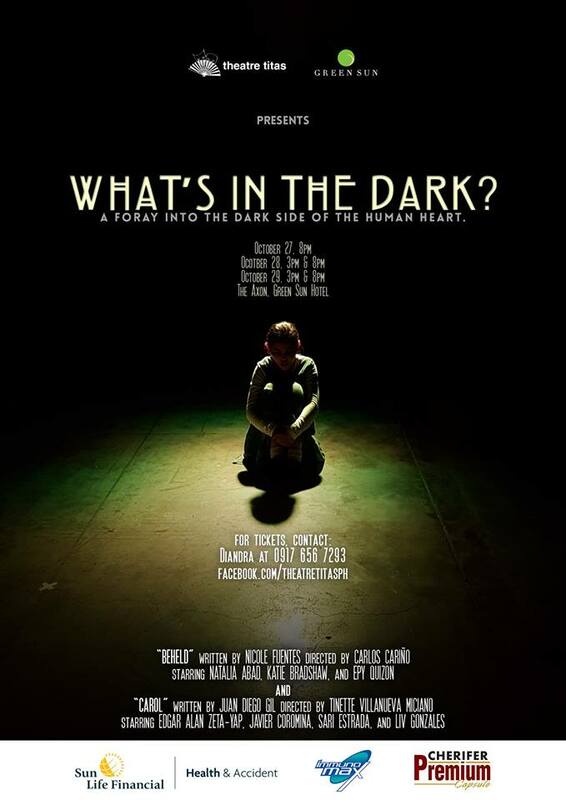 Check this play perfect for the Halloween weekend as staged by a new theater group, Theater Titas. Image sourced from Theater Titas’ Facebook page. “What’s In The Dark” features two original scripts, Beheld and Carol, both of which explores into the dark side of the human heart. Ticket price is at Php 500. For more information, visit Theater Titas’ Facebook page. Eastwood City’s Chocolate Festival gathers different chocolate brands and sweets-makers from across the Philippines to present their most decadent products for shoppers to sink their sweet tooth in. For more information, visit Eastwood City’s Facebook page. 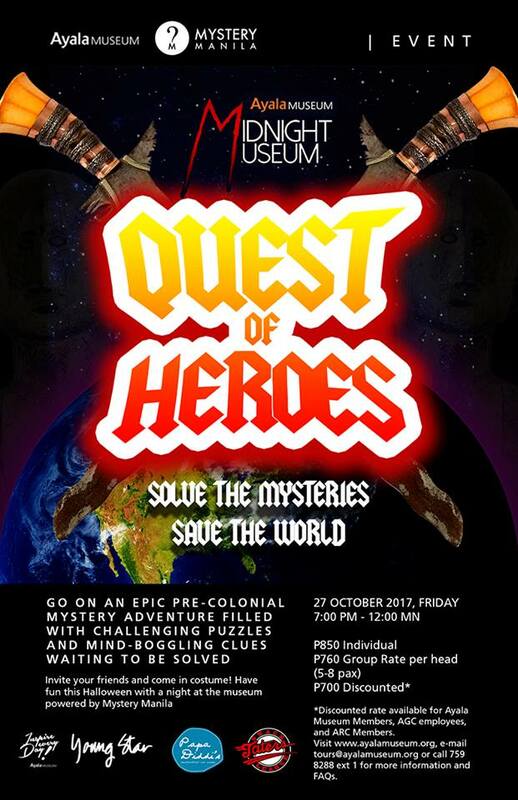 Come in your favorite costume with your friends and take part in an epic pre-colonial-themed mystery adventure filled with challenging puzzles and mind-boggling clues. Ticket price is at Php850 per person. For more information, visit Ayala Museum’s Facebook page. 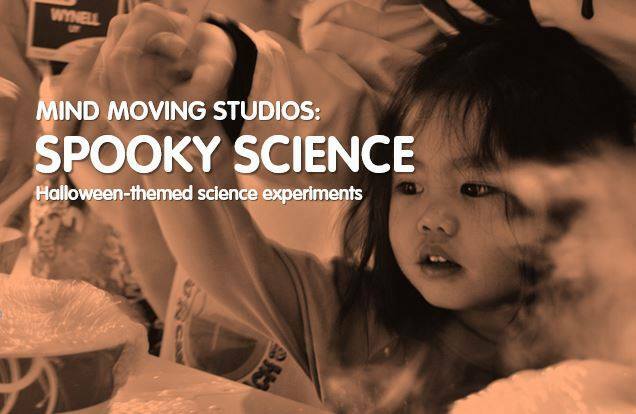 Geek out this Halloween week and witness some spooky science at this museum. Image sourced from The Mind Museum’s Facebook page. 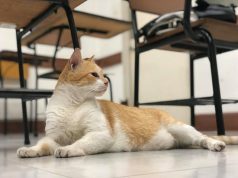 The Mind Movers, the resident scientists of The Mind Museum, are conducting Halloween-themed demos to spark some fun thrills and interest in physics, chemistry, and other branches of science. For more information, visit The Mind Museum’s Facebook page. Enjoy Coast Boracay’s luxury-grade amenities, and bond with your kids at Cha Cha’s Beach Cafe, which features Halloween kiddie activities including crafting drinks, crafts, parades, scavenger hunts, and many more. For more information, call (+632) 576-4555. Are you fond of clowns? If yes, then this party is for you! 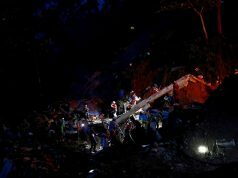 Image sourced from Eastwood City’s Facebook page. Party and play at this clown-themed, scary yet fun Halloween Party. 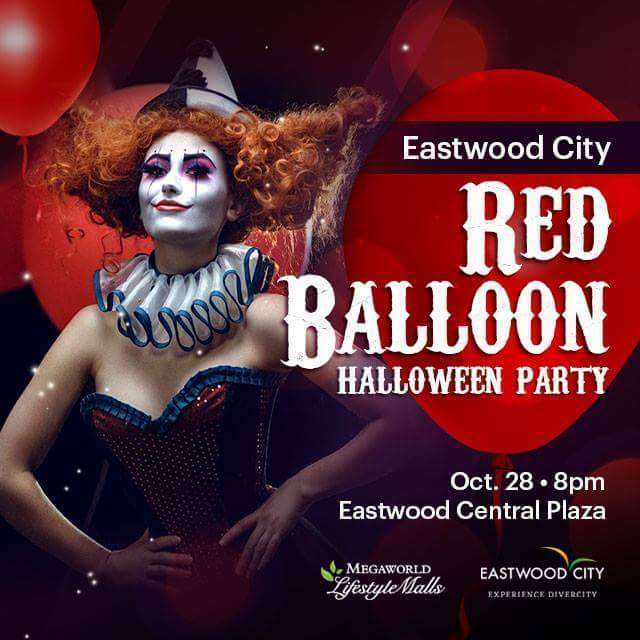 For more information, visit Eastwood City’s Facebook page. Treat your kids to this kid-friendly Halloween event this Saturday! Image sourced from Araneta Center’s Facebook page. For every Php 700 single receipt purchase from any Araneta Center establishment, entitles you to one entrance pass to the Halloween Carnival Fest that features trick or treat activities, costume contest, games, and more. For more information, visit Araneta Center’s Facebook page. 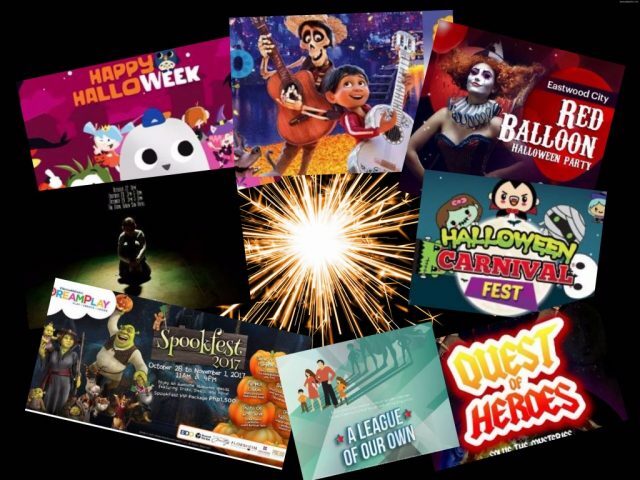 Trick or treat parade, magic shows, fun photo booths, and lots of exciting games and prizes are in store for you this season at different Robinsons Malls. For more information, visit Robinsons Malls’ Facebook page. Have a spooktacular Halloween with your family at Dream Play this weekend! Image sourced from DreamPlay’s Facebook page. 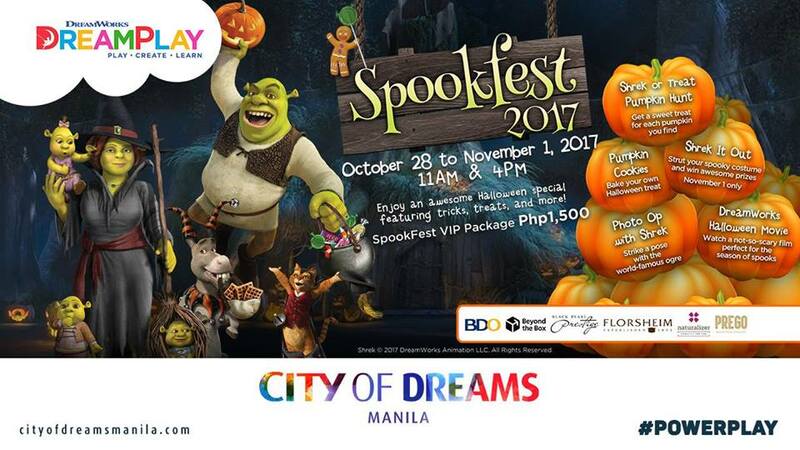 For Php1,500, get an all-day pass, which entitle you to a DreamWorks Halloween movie at DreamTheatre, a Spookfest bag, a photo with Shrek, pumpkin cookies from Gingy’s Kitchen, and a pass to Shrek or Treat Pumpkin Hunt. For more information, visit DreamPlay’s Facebook page. Spend an exciting Halloweek with your family enjoying fun activities at Kidzania. Image sourced from Kidzania’s Facebook page. Finish the Halloweek Alley Challenge to win cool treats, play the trick or treat board game, come in your most creative costumes, and join the ‘Hallowicked’ parade at this week-long Halloween celebration. For more information, http://manila.kidzania.com. 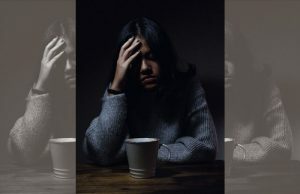 Watch and listen to indie music talents from Spain and the Philippines in this concert featuring various bands; Filipino poet, artist, and vocalist Dong Abay; and Spanish musician, Joe Crepúsculo. For more information, visit Instituto Cervantes de Manila’s Facebook page. A celebration of lights, festive music, and art, this event features free sweet treats, a trick-or-treat activity, a flamenco cultural show and workshop, an exhibition, and kids and pets fashion show. For more information, visit Venice Grand Canal’s Facebook page. 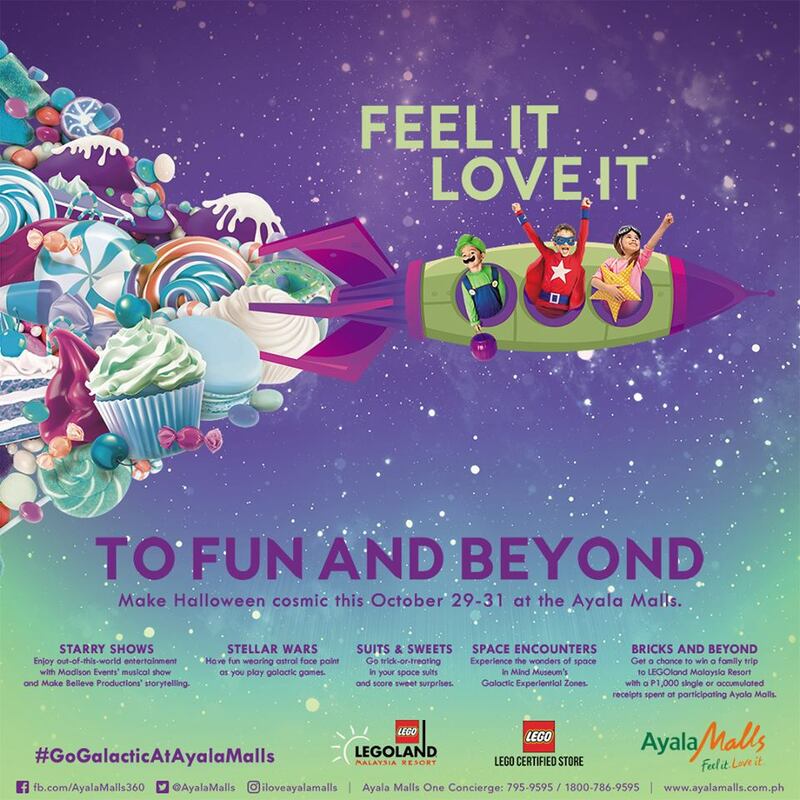 Feel and love the cosmic-themed Halloween celebration at different Ayala Malls nationwide. 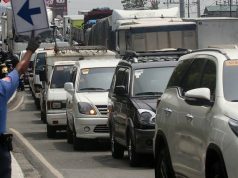 Image sourced from Ayala Mall’s Facebook page. 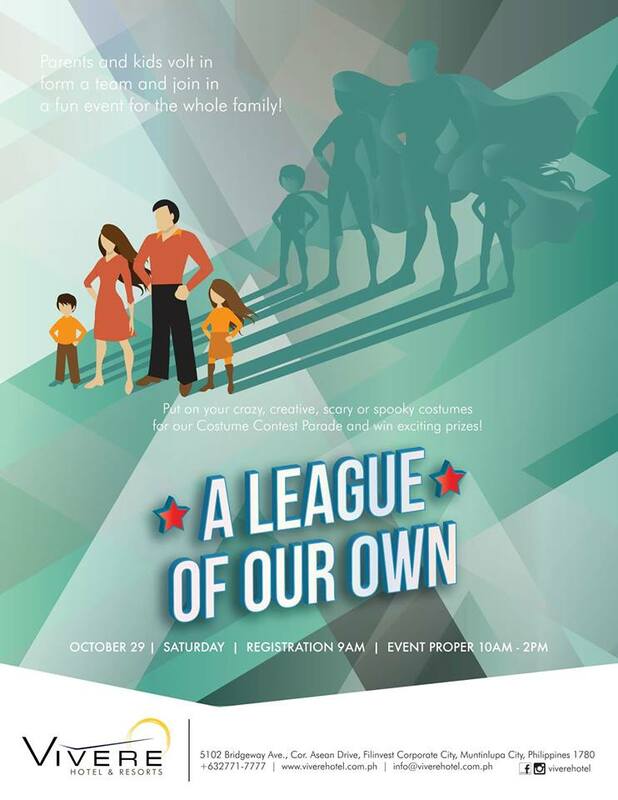 Stellar activities and prizes await at your favorite Ayala Malls including trick or treats, face painting, games, and even a chance to win a family trip to Legoland Malaysia Resort. For more information, visit Ayala Mall’s Facebook page. What better way to celebrate Halloween than being with your family dressed in your most favorite costume as a team? Make it happen at Vivere Hotel & Resorts this family day! Image sourced from Vivere Hotel & Resorts’ Facebook page. Dress as your favorite hero squad or as the villains, and get a chance to win a three-day, two-night stay at Hong Kong Disneyland for three people at this event filled with activities, loot bags, and enjoyable food. Ticket price is at Php 1,200 per person. For more information, visit Vivere Hotel & Resorts’ Facebook page.